To tour in North Vietnam or South Vietnam by motorbike is a difficult choice for the ones who’ve never been to Vietnam – a long country with plenty of difference between the Northern and Southern part. For all team of Vietnam Motorbike Tour Expert we do enjoy the motorbike ride in Northern Vietnam better. 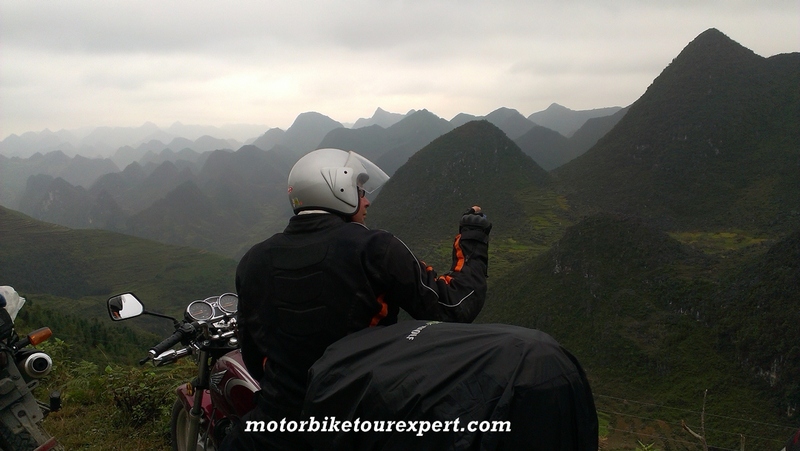 And this 8 day Northeast Vietnam motorcycle tour is always our favorite. This covers all the most scenic parts in the Northeast Vietnam excluding Ha long bay – a famous/touristy destination that is quite busy to come by motorbikes. 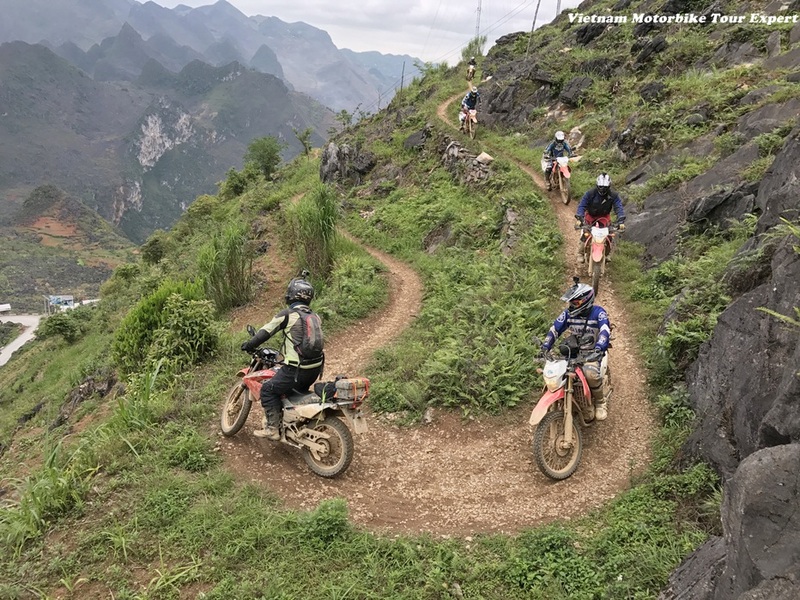 This 8 day motorcycle ride is just via the remote areas where you discover the local culture on the country and enjoy the imposing view of Ha Giang, Dong Van rock plateau, Thac Ba lake, Ba Be lake and also amazing Ban Gioc waterfall. Heading out of the Hanoi city on the bumpy but quiet dike road along the Red river, this motorbike ride offer a great view of the rural villages which located besides the green and large rice fields on the Red river delta, it takes quite short time to get close to the countryside. After the bike ride on the dike and luch in Doan Hung town, we can try some off-road motorbike ride crossing some hills of green tea fields, palm trees and rustic villages of the Dzao people. 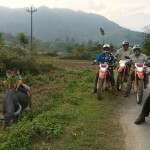 This is the short ride but could be memorable off-road motorcycle tour in Vietnam. We’ll end the first day ride at around 4:00 pm, leave the bikes with the family of the Dzao people and enjoy the short boat ride around the Thac Ba lake. Home stay in a nice stilt-house with the Dzao people in Ngoi Tu village. After saying goodbye to the villagers of the Dzao people, we continue the Northeast Vietnam motorcycle ride to Ha Giang. 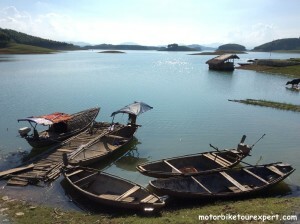 The ride in the morning is along the Thac Ba lake, crossing some short mountain passes and some rustic rural villages. After lunch, we’ll hit the smooth road straight to Ha Giang. We will arrive at Ha Giang town at about 4:00 pm, checking in the hotel, take your free time to rest then the tour guide have time to ask permits for the motorbike tour along the Chinese border in the next days. Today is the highlight of this North Vietnam motorbike tour. 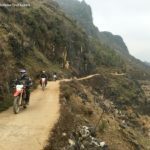 This short motorbike ride from Ha Giang to Dong Van is almost on the winding passes crossing the Global Rock plateau where you can see the most imposing view of the rocky mountain and the local hill tribes who have most difficult life. We can do stop every single kilometer to have interesting visit to local’s villages or to take amazing pictures of the scenery. This must be one of the best motorcycle rides in Vietnam. We will end the enjoyable motorbike ride in Dong Van at around 5:00 pm at, Check in a little hotel in town. This is another short motorcycle ride in North Vietnam, the tour can be start at 9:00 am after having a short walk to the ancient town of Dong Van to learn more about the Vietnam history, and discover the hidden beauty of the little township. We continue the North Vietnam motorcycle tour on the Rock plateau, crossing some imposing mountain passes and then heading down to the lower land to see the different beauty of the Northeast Vietnam. We’ll be in Bao Lac at 4:30 pm. Overnight in a hotel in small Bao Lac town. The Ma-Pi-Leng pass is one of the most imposing passes in North Vietnam we will cross through today. The pass is known as the Happy road connecting the remote community to the more modern area. However to make the pass done the Vietnamese Government have to spend a lot of time, money and even unluckily the death of the workers. 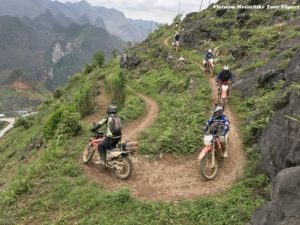 The motorbike ride on this pass which located at the level of around 1000 m above sea is for sure one of the highlights of the motorbike tours in Vietnam. After leaving the Bao Lac town, we keep riding along the river to Northeast Vietnam. The ride offers a different view of mountain from the view of the Rock plateau you’ve seen days before because we’re riding motorbikes in lower land where the plantation is different because of different kind of soil and different water condition. 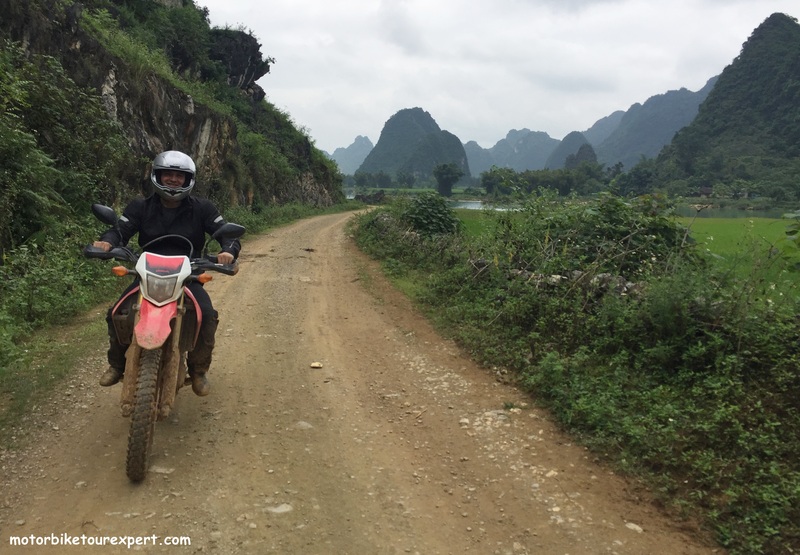 After lunch in the rustic restaurant in the middle of nowhere, we continue the Northern Vietnam motorcycle tour up to Cao Bang then cross the city to join again a quiet, joyful back-road to ride up all the way to Ban Gioc waterfall in the top North Vietnam. We’ll stay on the way at Quang Uyen town in the guest house or home stay with the Tay people. We’ll ride to the one of the most remote areas in the North of Vietnam which offers mostly back-road and off-road motorbike ride with beautiful view of mountain. We’ll get touched to the Chinese border where Vietnam and China share the most beautiful waterfall – the Ban Gioc waterfall. After picnic lunch nearby the waterfall, we’ll enjoy the relaxing time closed by the water, taking pictures of the nature’s beauty or swimming at the natural pool nearby the waterfall. In the afternoon, we’ll motorbike back to Cao Bang city and finish the highlight of the North Vietnam motorcycle trip at a hotel in city. Enjoy the night in one of the biggest town in North Vietnam that can make you understand more about the daily life and culture of the Vietnamese people. It’s another short motorbike ride to Ba Be lake but it could be one of the most enjoyable day of this motorcycle tour Vietnam. 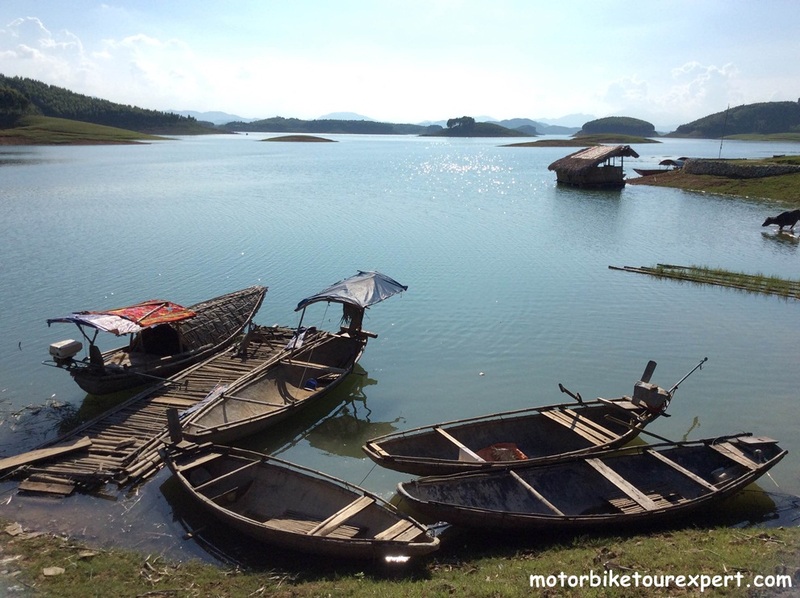 We’ll just do riding in the morning on almost smooth roads up and down then finish the ride at the peaceful village of the Tay people which located nearby the Ba Be lake – the biggest natural lake in North Vietnam. After lunch with the family we’ll enjoy a short boat tour around the lake. It’s the biggest day of this North Vietnam motorcycle tour, the motorcycle ride in the morning is still very beautiful and interesting but the another half in the afternoon must be on the busy roads, however our experienced team will do our best keep the ride safe to be back to Hanoi and end the great motorbike tour in Northeast Vietnam safely at about 4:30 pm. Please tell us which kind of bikes you’d like to ride and how many people in your group then we will give you the right price of the tour! Hi, I took one of your tours along the Ho Chi Minh trail 2 years ago and it was great. I am thinking about returning and taking a tour north of Hanoi. I would be a single person, but I would be happy to join a group. What vacancies and dates do you have for departing tours towards the end of this year?